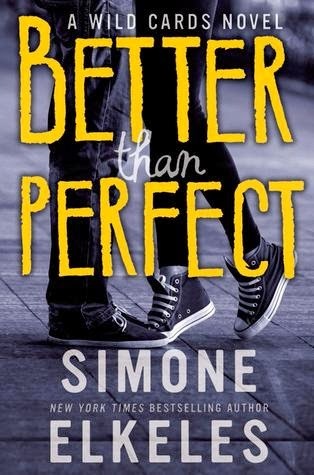 I was immediately intrigued when I stumbled upon Simone's novels a little while ago because I had heard so many amazing things about her Perfect Chemistry series, so I jumped at the chance to read this! So ultimately I was going into Better Than Perfect searching for a new favourite Contemporary YA Author! Ashtyn isn't your typical girl and her life is far from perfect. She's a football player for a start, and it's really important to her that she is treated as equal and not because she's a girl. Derek, on the other hand, is your typical bad boy. Expelled, he's sent to live with his Father's new Wife back in her hometown, walking right into Ashtyn's life and shattering it into thousands of complex little pieces. At first it seems like this is your usual bad boy meets good girl, but when Better Than Perfect gets going, it headed right into my favourite reads right away. Ashtyn and Derek's connection is lively and they weave straight into each others lives, the game of back and forth glances and flirty conversations become more inevitable. Ashtyn is a very driven, hardworking girl and all she wants is to be noticed doing what she loves in football, maybe even to get a scholarship. But Derek isn't driven for anything like Ashtyn is, and he knows her type just like she knows his. They're not "supposed" to be meant for each other, but their fiery chemistry begs to differ. From the nicknames to the addictive, enchanting romance, Better Than Perfect played all it's cards right for me. Simone's writing style was charming and distinctive, and I can see how she is easily one of the best YA Contemporary authors out there. Overall, Better Than Perfect couldn't have been better - it was perfect. For fans of Katie McGarry, Simone's novels are on my TBR list for sure now! I can't wait to read more from her. I think there were so many little moments that were my favourites, it would give away WAY to many spoilers if I even dared. But when you read them, they'll become your favourites too, definitely. Like I said above, for fans of Katie McGarry and anyone who loves a YA Romance with an unique spin on it. Have you read Better Than Perfect?